Mariachi Divas: Tigger Travels - Family Adventure Journal Photos From Tigger`s Travels and MORE! Official Website for The Mariachi Divas with their Tour Schedule, Audio and Video Clips, Photos and Contact Information. Founded and directed by trumpet player Cindy Shea in 1999, Mariachi Divas are making big waves on the national music scene. Mariachi Divas are a unique, multi-cultural, all female ensemble, imbued with the true flavor of Los Angeles and have been represented by women of Mexican, Cuban, Samoan, Argentinean, Colombian, Panamanian, Puerto Rican, Swiss, Japanese, Honduran, Peruvian, Tongan and Anglo descents. Cindy Shea states, "Music is a way of uniting our cultural backgrounds". In 2009, Mariachi Divas won the Grammy Award for Best Regional Mexican Album of the year for their 2008 release, Canciones De Amor. This marks the first time in the history of the National Academy of Recording Arts and Sciences that an all-female mariachi group has been a nominee, or of course, a winner. 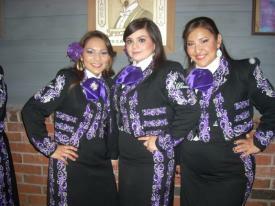 Mariachi Divas have appeared at Southern California venues such as Arrowhead Pond, Universal Amphitheater, Staples Center, the Greek Theatre, the Santa Barbara Bowl, the House of Blues, the LA Forum for the 2005 Premio La Gente live TV awards show and the Shrine Auditorium for the 2006 Alma Awards. They have also accompanied Grammy- winning artists such as Joan Sebastian, Jenny Rivera, Marco Antonio Solis, Pablo Montero, Graciela Beltran, Natalia Jimenez and Paulina Rubio. 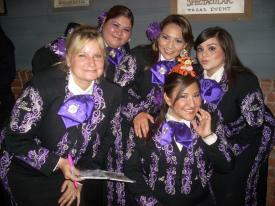 The Divas have performed dozens of shows with the world-renowned Mariachi Vargas. Each January since 2001, the Divas have showcased their innovative sounds at the National Association of Music Merchants (NAMM) convention in Anaheim, California. They have performed at the Tucson International Mariachi Concert, the Las Cruces Mariachi Conference and the Fresno Radio Bilingue Mariachi Show. Mariachi Divas were featured as one of the main televised acts, in front of over 500,000 people on the streets of downtown Los Angeles, at the largest Cinco de Mayo celebrations in the world: the 14th and 15th Annual Fiesta Broadway in 2003 and 2004. They have appeared at both the Los Angeles and Orange County Fairs numerous times, as well as other state and county fairs across the country. The Divas have not only traveled throughout the USA for performances in Arizona, New Mexico, Nevada, Utah, Idaho and Wyoming but also performed in Tampico, Mexico in 2004. Mariachi Divas have appeared several times at the John Anson Ford Theatre in Los Angeles, promoting and producing their own shows there.